We went down to Kenridge Dam this evening for a mini-outing, just before sunset. We haven't been to this particular dam for quite some time, and I was stunned to see how tall the reeds have become and how much of the dam is now being taken up by them. They must be covering at least three-quarters of the dam already - I can't imagine that this is good for the dam's eco-system. These Egyptian geese looked quite happy waddling around on the banks though, so I'm guessing it's not affecting them too much (yet). Posted in General and tagged animals on Friday, 30 January, 2009 by Kerry-Anne. 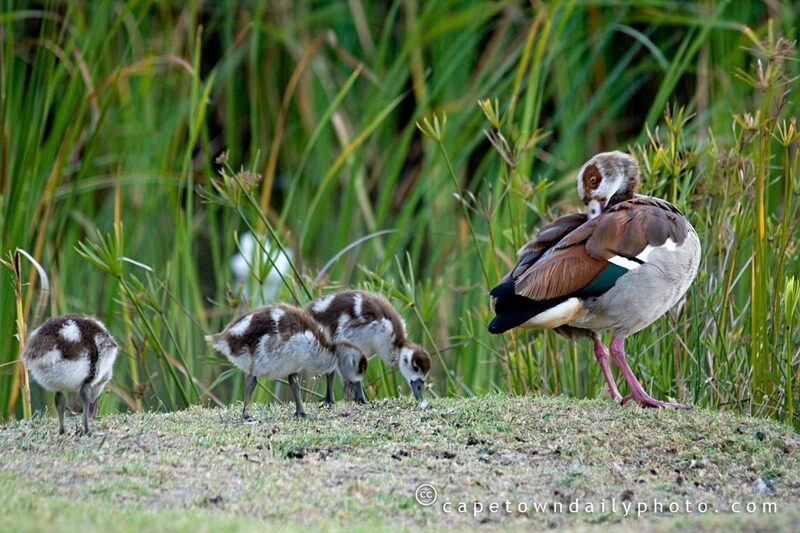 Nice photo, ducklings, goslings always make for a good subject. It is the middle of winter here in Yorkshire, snow today, so it will be a while yet before I can take such a photo. These Egyptian geese are a seriou problem for golf course’s.How do we get rid of them permantly, as they destroy our greens and tee boxes.